The “31 Days in July” project was conceived and launched in July 2003 by Washington, DC artists Matt Sesow and Dana Ellyn. Inspired by the March 20, 2003 invasion of Iraq by the United States, Sesow and Ellyn wanted to immerse themselves in a project that would not only emphasize their dedication to painting but also help entice them to document the historical events taking place within their lifespan. They decided to commemorate each month of July, by creating paintings about the news of the day. The 31 paintings are created and completed in Washington, DC. Each day, during the month of July, Sesow and Ellyn awake to pour through the morning news looking for inspiration to guide the day’s painting. Each painting must be started on the day it was inspired. At the end of July, at midnight, all 31 paintings are completed. During the first seven years of the project, Sesow and Ellyn limited themselves to using the front page print edition of the Washington Post as their guide. Beginning in 2011, the artists decided that the print edition of the Washington Post no longer adequately covers the important news in a timely fashion and oftentimes diverts reader focus to trivial fluff. 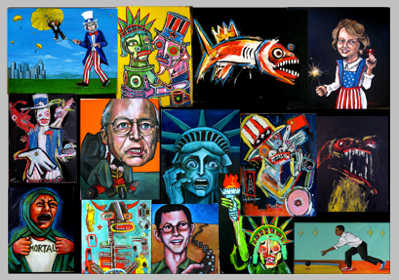 The artists now scour a multitude of references including domestic and international sources ( such as Democracy Now, Al Jazeera, RT, and the Guardian ). Emphasis being on “historical importance” and the political influence enacted by Washington, DC on world events. They will look to what was, and what wasn’t covered by mainstream media, to provide inspiration.